Have Minister, Tourism Central Australia acted on tragedy? This is how we ended a report on February 23 about the horrendous deaths of German Tourists Wilfred and Gisela Thor who perished in Central Australia, not somewhere in the remote Simpson Desert, but in one of our highly promoted national parks, Trephina Gorge (pictured), a mere hour’s drive from Alice Springs. Today, 200 days later, we still haven’t heard a peep out of TCA, despite renewed requests for comment last week. And Ms Moss said yesterday that “our thoughts and prayers are with Mr and Mrs Thor’s family” but she won’t comment on circumstances surrounding the deaths until the coroner has handed down his or her findings. According to a spokesperson for Ms Moss the coroner will start investigating those circumstances in January – almost a year after the tragedy, and the investigation will likely take some weeks of not months. Does Ms Moss suggest the coroner would condemn the rectification, in the meantime, of life threatening practices that have become apparent? And as for the mostly taxpayer funded TCA (in 2016 grant funding was $886,818 of total revenue of $1,287,737), it clearly doesn’t think it needs to inform the public about its actions – if any – to rectify deficiencies in the industry it represents. TCA, it seems clear, is more interested in self-congratulatory dinners. Ill prepared and and ill informed, Mr and Mrs Thor perished in near 40 degree heat. 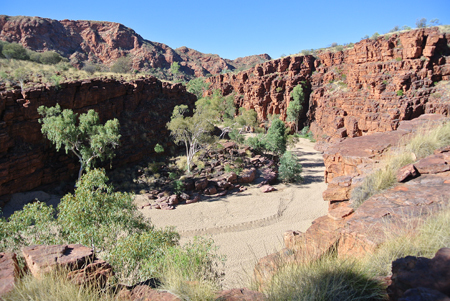 The couple, both in their seventies, drove themselves to the Trephina Gorge park in a small hire car on Friday, February 14. The maximum temperature at the Alice Springs airport on that day was 36.3 degrees. On the next two days it rose to 37.7 and 39.1 degrees, respectively. Our report raised a series of actions that could have averted the tragedy. With the summer around the corner we’re asking the questions again. Signals of these pockets size transmitters are picked up by high flying aircraft. “Search and Rescue (SAR) time only raises the alarm. It does not locate the person,” says Senior Sergeant Potts. “At the end of the day prior preparation is always the key and if you are ever lost, I do not encourage people to try and self-extract as this only depletes a person’s water supplies and lessens a person’s time frame for survival. It is known the Germans had contact with at least two people: The person who hired them the car and the person who checked them into a hotel. And the park staff should have reacted surely much sooner to a small car without any obvious camping equipment parked over night in the Trephina Gorge carpark. As it turned out, the car had been there two nights before the search began – the third day after their arrival in the national park. What advice had these visitors been given by the car hire company about the potentially life-threatening conditions of being in the Central Australian bush in summer heat? Why did the hotel not raise the alarm at the time when the two could still have been rescued? Our report canvassed simple search and rescue systems – have they been introduced? The taxpaying public, funding the TCA and the government in which Ms Moss is a minister, deserve answers. I agree with you Matt, especially having worked in the tourism industry. I can say that I have heard everything when giving advises some: I am on holidays, I do what I like! I am old enough to know what to do! I never wear a hat and I am not going to start to please you! Are we in a police state that you are asking me what time I will be home?! Do you think I need so much water? You want me to wet my pants? This is nearly on all traveling websites. Check the length and difficulty and if walking without a guide, tell someone where you’re going and when you expect to return. Wear protective footwear, a hat, sunscreen and insect repellent, carry a map and plenty of water. When walking read maps and signs, stay on the track, behind safety barriers and away from cliff edges. Dehydration is a common condition suffered so increase your daily fluid intake to approximately one litre of water per hour. Many parks and reserves do not have a supply of drinking water so always carry water with you. The sun in the Red Centre is strong, always wear a shirt, hat, sunglasses, and a minimum SPF 30+ sunscreen lotion. Apply sunscreen regularly, even if cloudy, and stay out of the sun during the middle of the day when the sun is strongest. What more do we need? We talking about adults who should know how to organise a trip in a foreign land. Sometimes people don’t come home for a variety of reasons. I don’t think an accommodation house anywhere in the world should be expected to parent guests behaviour.